AMMONNEWS - Tomb-raiding vandals have stolen the head of an 800-year-old mummified body known as the ‘Crusader’ from a Dublin crypt, police and church officials said Tuesday. 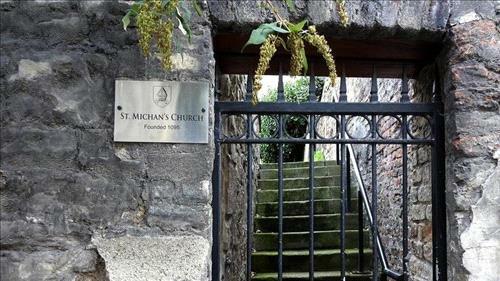 Several other mummies including the 400-year-old remains of a nun were also “desecrated” in the incident at St Michan’s Church, whilst the burial chamber itself was “badly damaged,” the Church of Ireland said. “I am shocked that someone would target this ancient burial place and desecrate the remains of those lying within it,” said Archbishop of Dublin Michael Jackson. “The Crusader” is so-called because he is believed to have perished during or shortly after participating in a campaign to capture the holy city of Jerusalem. Because of his impressive height, the Crusader’s legs were broken and folded to fit his remains inside a coffin in the St Michan’s crypt. The church – founded in 1095 – is a popular tourist attraction in the Irish capital. The crypt was targeted by thieves overnight between Saturday and Sunday, police said. The discovery that it had been plundered was made on Monday as a guide prepared to open the church to visitors, the Church of Ireland said. There are fears that the preserved head will degrade in the open air, outside the conditions of the crypt which limit decomposition. “The actions of these people are devastating and sacrilegious,” said Archdeacon David Pierpoint, the parish priest.